I’ve been in the mood to make ethnic inspired foods lately. Recently I made some Greek inspired dishes as well as some Asian inspired dishes. I’ll be sharing the recipes for those with you soon. 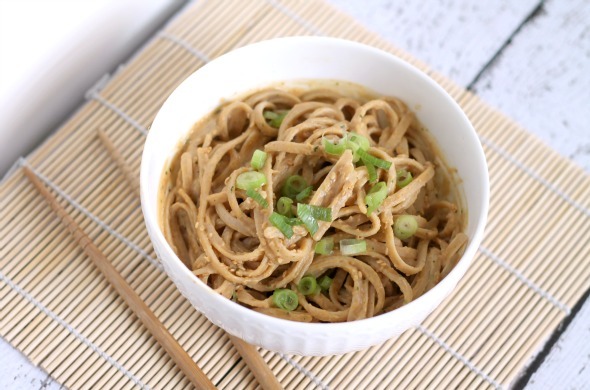 Today I’m going to share a recipe for Thai Peanut Sauce with you. I found this recipe over at one of my favorite blogs, Budget Bytes. If you haven’t checked out Budget Bytes yet, you really should. There are all types of budget friendly recipes on the site, along with some great food photos. You’ll definitely leave the site hungry. If you’re a fan of peanut butter like I am, then you’ll love this recipe. It definitely has a strong flavor of peanut butter but the peanut butter blends well with the other flavors in this recipe. I hope you enjoy this tasty recipe. Bring a large pot of water to a boil and cook the noodles. In a food processor, chop the garlic and cilantro. Add the remaining ingredients, minus the water, and process until smooth and well blended. Add the water and process. Add more water if you want a thinner consistency. 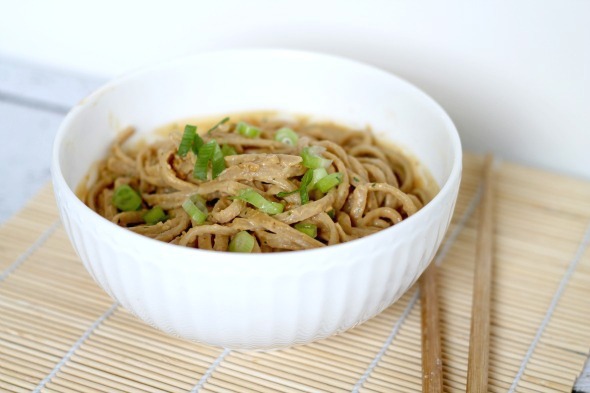 Top the noodles with the peanut sauce and garnish with green onions and sesame seeds. No lie Julie I made something very similar to this last week for lunch, but with carrots and zucchini, it was so good I ate it all without photographing it. This looks so good! Ok DELISH!!! I will be making this for our date night day! My hubbie will love this! We love Thai food & this sounds sooo good!! Wanted to stop by & let you know that you are one of my features this week at Mom’s Test Meal Mondays! !